A cameraman of the opposition aligned Raajje TV was forced to erase footage of a meeting between prosecutor general Muhthaz Muhsin and criminal court judge Abdul Bari Yousuf at a café, the broadcasting commission has found. The PG allegedly met Bari at the Café Layaali in Malé on March 8 while the latter was presiding over former president Mohamed Nasheed’s terrorism trial. The pair have denied the meeting took place, and Muhsin has previously said he would resign immediately if the allegations are proven to be true. 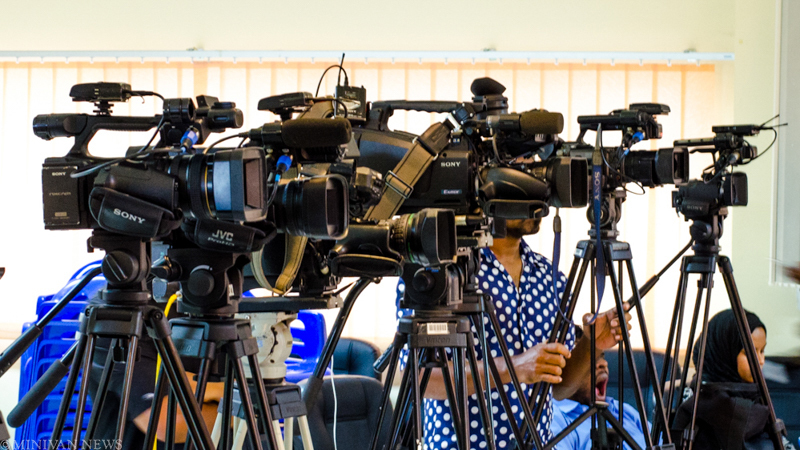 “As the commission saw that this was a situation that obstructed press freedom, the members who participated in the meeting to conclude this case decided unanimously to appeal to all parties to ensure that broadcasters and the media as a whole do not face such compulsion in order to maintain an environment where journalists can fully exercise the right guaranteed by the constitution and laws without fear,” reads the summary statement of the report prepared the commission. The commission also investigated a complaint alleging that Raajje TV disseminated false information as PG Muhsin denied meeting the judge. The commission decided that the station did not violate the broadcasting code of content as it had sought comment from both Muhsin and Bari. The meeting took place days before a three-judge panel sentenced ex-president Nasheed to 13 years in prison on terrorism charges. Judge Bari also presided over ex-defence minister Mohamed Nazim’s trial on weapons smuggling charges. Muhsin meanwhile told Minivan News at the time that the judge was already at the café when he went there for a meal with family members. However, Raajje TV insisted the pair were sitting at the same table and that Muhsin had walked away when the journalist started asking questions. At the time, a Raajje TV staff told Minivan News that a group of young men led by Progressive Party of the Maldives MP Ahmed Assad forced the cameramen to delete the footage. In 2013, the watchdog Judicial Service Commission suspended Judge Bari for over a year pending the outcome of a complaint lodged against him for alleged misconduct. Although the commission did not reveal any details of the complaint, local media reported that a female attorney from the Prosecutor General’s Office had alleged that Bari had sexually assaulted her. Bari was cleared of the allegations and resumed duty at Criminal Court on July 24, 2014. The cameraman is at fault here. He should attend some seminars on covert photography, wiretapping, data security, plausible denial and intelligence gathering. The judges are enemy combatants. They have no rights.